Abstract: A 14 year old female spayed standard poodle presented with a 1 month history of hind end weakness that progressively worsened over the last few weeks especially on the right. Suspected mild IVDD and osteoarthritis was diagnosed. 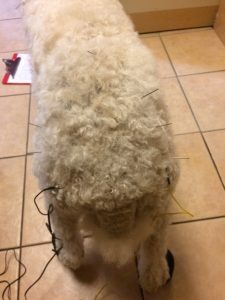 The treatment plan involved medical management with Rimadyl, spinal and hip radiographs, canine orthopedic boots on the hind paws, acupuncture, laser therapy, and electroacupuncture. Instructions were also given for owners to give light massage to patient daily around the lumbosacral area. Response to treatment was a success thus far with continued acupuncture, laser therapy, electroacupuncture, decreased nsaid therapy, and no need for orthopedic boots at this time. 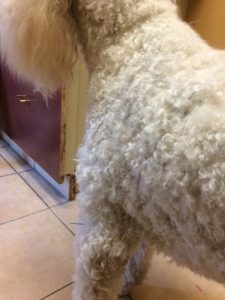 History and Presentation: Patient is a 14 year old female spayed standard poodle that presented for bilateral hind end weakness, difficulty rising and sliding on wood floors. Owner notes that patient appears to have more difficulty on the right hind and it has been a slow progression. No history or orthopedic trauma. Past medical history includes septic peritonitis secondary to stump pyometra. Patient recovered uneventfully after surgery and extensive supportive therapy (2013). Physical Examination and Clinical Assessments: T: 101.2 P: 80 RR: panting BCS:5/9 MM: pk/moist crt<2. Neuro mild decreased CP’s in the right hind, bilateral hind end paresis. MS: grade ¼ right hind lameness, repeatable pain response at lumbosacral junction. All other physical exam parameters within normal limits. Myofascial palpation revealed taut bands bilaterally along the lateral cervical spine, muscle fasciculation’s appreciated during lumbosacral palpation, and multiple trigger points appreciated on both biceps brachii. Medical Decision Making: Due to the chronic nature of the disease and initial reluctance of the patient a slow progression of treatment was used. The initial consultation was 60 minutes. This included the consultation to discuss previous medical history, diagnostic results (blood work/radiographic findings) myofascial palpation and initial needling. After the initial consultation we began weekly treatments for 6 weeks followed by every other week. Differential Diagnoses: Due to the physical exam differential diagnosis included mild intervertebral disc disease, osteoarthritis, trauma and neoplasia. Definitive (or Putative) Diagnosis (or Diagnoses): Radiographic evaluation helped confirm suspicion of mild IVDD and osteoarthritis. Ideally CT or MRI would be warranted but the owners declined at this time. lumbosacral area. After the first 2 treatments the patient significantly relaxed and we were able to apply needles to the above mentioned points as well as start electroacupuncture at the lumbosacral area. All of these modalities have been well tolerated by the patient especially when frozen baby food is offered. In addition to acupuncture the owners have been applying light myofascial massage at home at least once a day as well as initially using orthopedic boots at home on the hind end for stability. After the first 6 weeks of treatments the patient no longer required the boots. few weeks from humane euthanasia. What an incredible feeling to give this patient and her family some more time that is pain free and joyful. Interesting literature- “Effects of electostimulated acupuncture on ground reaction forces and pain scores in dogs with chronic elbow joint arthritis” Bollinger et al. Vet Comp Orthop Traumatol 2002; 15: 116-122.